The roses growing on the side of the house are the most fragrant ones we could find (Etoile de Hollande is the name of the variety) and let me tell you, they are real floozies. They flop open and let out a scent that could hypnotize you. They smell good enough to eat, but when I thought of bottling that smell this year, I wanted roses that I could drink – rose sherbet, or gül şerbeti (ş=sh). Sherbets are like cordials- sweet syrups flavored with fruit, spices or flowers that are mixed with water and can be served cold or hot. Sherbets were once quite important social lubricants here in Turkey. If social convention frowns upon alcohol, you can ply your guests with the next best thing- sugar. From the palace to the street corner, sherbet kept conversations cordial. It is still among us, though today it is more common on special occasions; I have fond memories of lahosa şerbeti, the sweet spiced drink served to new mothers, as well as to any well wishers. Rose sherbet is not to he confused with rose water. Rose water is a by-product of the production of rose oil and is made from the pink Damascus rose. Rose sherbet is made from scented red roses and the process, unlike that of rose oil production, is quite simple. 1. Gather your roses. This is probably best done early in the morning or on a cloudy day so the flowers will be at their best. (I did neither of these. 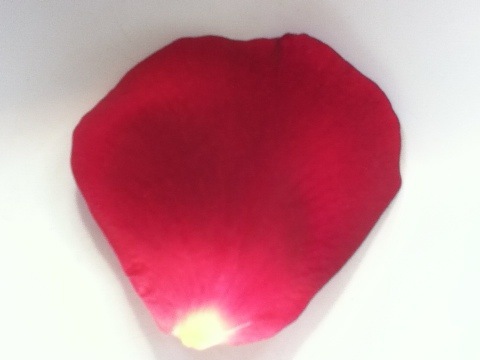 )It took about 30 roses for me to get enough petals. 2. 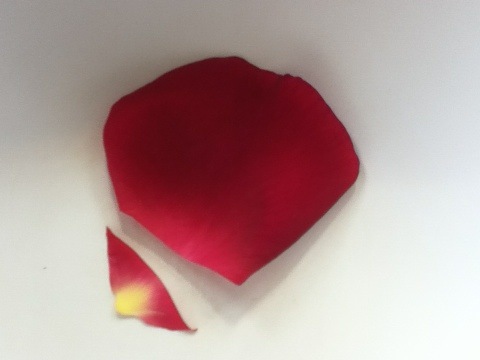 Remove the petals. You will want to shake your roses out as you do so, to evict any critters. I dislodged a number of small spiders from mine, as well as some very tiny mite-like insects. 3. The petals of the rose are tasty, except for the yellow bit that attaches it to the flower. This should be removed, making this step the fiddly part of the recipe. Get out your scissors and pretend you are a palace kitchen lackey. 4. Wash the petals under cool running water. It will bring to mind laundering silk hankies. 5. 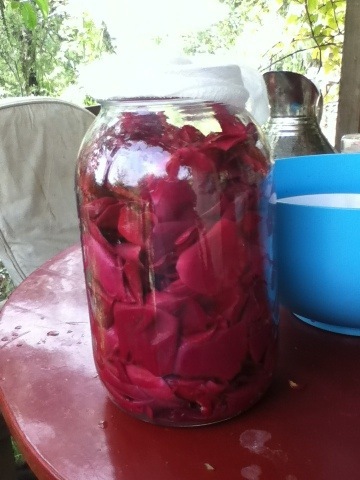 Stuff the petals into a jar. 6. Squeeze the lemons juice and pour it over the petals. Mix it around a bit with your hand to cover them all, then cover the mouth of the jar with a cheese cloth and tie it tightly. Leave it in a shady spot (or in a cupboard) for a week. 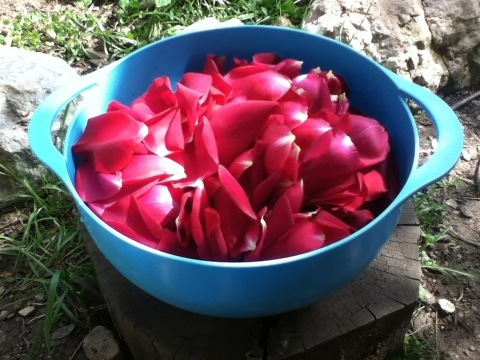 During this time, the scent and color of the petals will be transferred to the lemon juice. 7. Take out the rose petals and add half of the sugar. Let this mixture sit for another week. 8. Now add the remaining sugar and the water and mix well. Strain the liquid and bottle it. To drink, pour a finger or two of syrup into a glass, top with water and add ice. The syrup should keep a good long while in the fridge. Wow. Can’t wait for the next chapter. I hope to have an update up soon! Well, you certainly captured my attention with this post. Rose sherbet? I’ve never heard of it before. Looking forward to step 2. I’m glad you mentioned that, because I sometimes wonder, as perhaps we all do, if the things I mention are glaringly obvious to all and sundry. Any excuse to bring a basket of rose petals into the house is welcome. That looks incredible! I wish I had some rose bushes. Heck, I wish I had a garden! I bet it makes the whole room smell lovely. 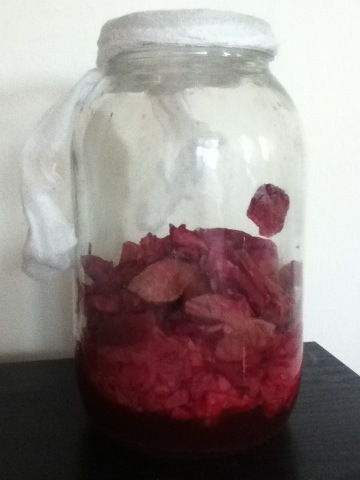 I just saw a recipe for rhubarb and rosewater syrup too that this would be perfect for. Oh that sounds so nice- I love rhubarb, but it has never occurred to me to pair it with rose. I like the idea of complementary colors! Now, the next step…lassis with your drinkable roses! Thoroughly enjoyed your post and learned something new, looking forward to the next chapter.